If you’re going to start a new blog or want a creative catchy name for your Online business, the first question is this: What do you name it? Finding the right domain name is the very first step in naming your blog or brand. Note:A domain name is more than a web address. It is your Brand, your business, and the most important your very online identity on the internet. Make it recognizable, easy to remember, and a proud representation of you and your brand Business. Examples of domain names are Facebook.com, Apple.com, and Wikipedia.org. You want the name and the URL to match; this is all part of creating a memorable experience for your users. And honestly, new bloggers don’t spend enough time thinking about the brand of their blog. There is an art form to choosing the right domain. The name has to be short, easy to remember and describe exactly what the site is about. Nowadays, Finding the right one may seem downright impossible. Why is your domain name so important? A domain name is how your website will be known online, no matter what type of website you’ll have. It is the unique address of your site on the internet and it will be yours as long as you continue paying the annual fee ($10 – $15 for .com domain). 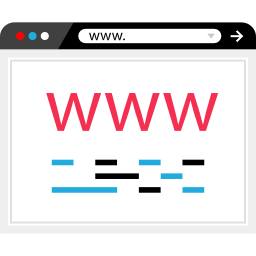 Users who know your domain, technically referred to as a URL (uniform resource locator) can simply type it in their browser’s address bar, and be taken there. Others will be able to discover your blog through search engines such as Google and Bing. Prefix – It is an internet application protocol of your domain (http: – standard, https: – secured). Subdomain – It is the third level domain of your website name (some sites use “www”, “hindi.domain.com” some not). Name – It is the second level domain of the website, picked by the person registering the domain. The original top level domains (TLDs) include: .com, .net, .org, .info, .gov, .edu, and .tv. Only some of them are available for general use, and .com is far and away the most important. Many country code top level domains (ccTLDs) exist, including: .au (Australia), .cn (China), .in (India), .jp (Japan), .ph (Philippines), and .uk for (United Kingdom). When you create a free website on a free blogging platform, your site’s default address will look something like example.freebloghost.com. When you’re ready to build your professional presence, buying a custom domain — such as yourdomain.com — is a great next step to personalizing your site and carving out a space for your business online. You can register a domain in a few clicks, but choosing the right name for your site can be a challenge. 1. It’s your “first impression”. Your URL is the first thing your visitors will see. A good domain name can make a positive and lasting impression, while a bad domain name can send visitors running. 2.It affects SEO. While exact match domains (EMDs) are no longer a necessity, keywords in your domain name can still help your SEO ranking. 3.It defines your brand. We’ll talk about this in a minute – but your domain name is a branding opportunity. The right domain name can increase brand recognition. Tip:You can also use domain name generators for finding creative branded domains. Here are some tips to help you pick the perfect domain name. Finding a domain name that’s easy to type is critical to online success. Avoid words that are easy to misspell and words with multiple spellings. You can check this example: – TechBuzz and tekbuzz or techiepie or techypie. So confusing na? If your domain name is long and complex, you risk customers mistyping or misspelling it. Short and simple is the way to go. Shorter domain names are easier to spell and to remember. Try using keywords that describe your business and the services you offer. For example, if you’re in a food business, you may want to register foodie.com or foodbood.com. It helps improve your rank on search engines (which increases traffic) and just makes more sense to your customers. Let take this site as an example, BlogTipsTricks means i can rank easily on words like ‘blogging tips, blogging tips and tricks or tips and tricks blog’. These are often misunderstood — people who hear your web site address don’t know if you’re using a numeral (5) or it’s spelled out (five) or they misplace or forget the dash. If you need these in your domain, register the different variations to be safe. Make sure the name you’ve selected isn’t trademarked, copyrighted or being used by another company. It could result in a huge legal mess that could cost you a fortune, as well as your domain! To check within US, visit uspto.gov/trademarks and do the search before you register the name. .info : for informational sites. Domain names sell quickly. Thankfully, they’re also inexpensive, so register your favorite domain names as soon as possible. If you’re having trouble finding an available name, domain generators like Wordoid will suggest alternate names according to your domain search to help you find the perfect domain name. For many people, their first impression of your business will be through your domain name. Getting your domain right is the first step to building a long-standing online business. Tip:Don’t be afraid to add your own flavor. Use common knowledge and be sensible. Try your best and get creative. Utilizing the list of tools in this blog post and the newly available domain extensions should help you generate some ideas and assist you in registering your perfect domain name. What is your best tip for choosing a good domain name? Feel free to leave your suggestions or comments below. Some of the new gTLD like .club, .shop, store, .website, .online will also be one of the unique domain extensions to go for aside from the .com/.net domain as it’s more harder to get the preferred .com/.net domain seeing the registration has been on-going for sometimes. If you are starting a content conversation website such as WordPress blog, you can optionally go for the .blog domain name. I personally use .in for Indian traffic and .com for Worldwide. .Net when .com is not available. Thank you for providing the checklist for finding a branded domain.